As many of you know, I volunteer a week and then some to support the Burn Prevention's "Concours of the Eastern United States" every February. It's always a good time for a good cause as the proceeds raised from the Concours d' Elegance support "Home Safe Home," a national program to educate school age children about burn prevention. 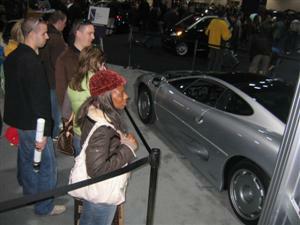 The vintage cars are at the Philadelphia International Auto Show to promote the Concours and we always have the "Best of the Best" and this year held no exceptions. Mike Jones from the AACA and I started trading emails around Thanksgiving to select the dozen or so cars that we could place in our exhibit. This years' theme would be "A Century of Automotive Innovation", with a sub theme of "FINS". As a member of the Concours Selection Committee we were now busy assembling a field of cars that represent the "First of" in their respective innovation for the show. "FINS" would be present as well, as they first appeared in the late forties on Cadillacs and slowly turned into rockets in the early sixties T-Birds. So what does this have to do with British Cars you may ask? Mike counts on me to find the British Cars that work with each year's theme. Each year we try to not repeat any cars that we have had in past exhibits. Innovation in post war British cars? Hmmm. Jaguar's double overhead cam was innovative, (it lasted for over 40 years) but we already had Shelley and Bruce Menkowitz's XK 120 at the show a couple of years ago. Hmmm. "How about FINS?" I say, "Who has fins??" How about an SP 250, you know, the car that has that crazy smile? 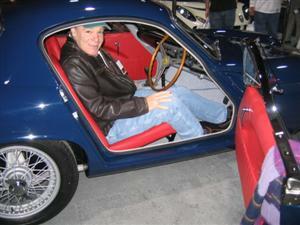 Carol and Brad Rosengarten were nice enough to "lend" us their 1962 Daimler Dart SP 250 to take to the exhibit. Their car has appeared at the Concours in the past and Brad plans to bring it to the show again this year. Some of the biggest were the early Sunbeam Alpines and most of them rusted away, as well as having long been crushed and reborn as Maytag washers--Hmmm??? Since we could not get any early Alpines, a Sunbeam Tiger will fill the FIN order! Again a familiar face around Ragtops & Roadsters came through, as Sumra Manning was gracious enough to bring his 1966 Sunbeam Tiger Mk 1 into our exhibit. We also had a 1959 Lotus Elite, the whole car being a fin, as it has a drag coefficient of 0.29 (a very respectable number by today's standard). It's a recent ground- up restoration that is in the finishing stages here at the shop. Long time owner, Joe Marchione was very pleased to see the car come together for the show. This car has been accepted to appear at this years' Concours. New for 2008, a "Supercar Class" has been added. 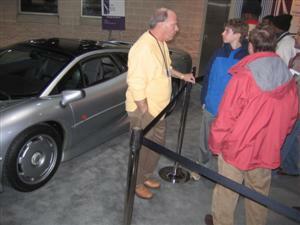 Jeff Sturgis, who showed his car last year in the sportscar class agreed to bring his Jaguar XJ 220 to our exhibit. What an eye catcher! Showing it's long side profile, it attracted many enthusiasts who had never seen one. Less than 50 here in the states and fewer than half are road legal, Jeff drove it in from Bucks County! As the week went by, I noticed that many British Sportscar owners stopped to take a look and to say hello. From all the British marques, many came just to connect with their favorite car from across the pond. Still car guys and gals as Barry Meguair would say! What I noticed the most was the longing smiles at the vintage cars. Those smiles were not there for today transportation, but for a reflection of good times we had of year's gone by. However, most of the stories were of how the cars failed, or how got stuck in a ditch, intermittent fuel pumps, smoking wires, crashed cars, leaky tops, rusty rockers, oil puddles, and yet we all smiled!! Isn't selective memory a great thing! 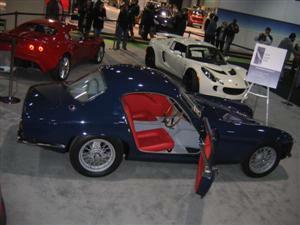 Oh by the way, there were some new cars at the Auto Show, or so I was told. Somebody said the new Vette could do 200+ MPH Too fast for the road... I guess I am officially an Old Car Guy now?